I admit that I am new at this; however, I think that I can say without asking to have my greenhorn opinion validated that one of the greatest and simplest joys of being a vegetarian is enjoying food directly procured from Mother Earth. Not that you can’t enjoy it being the run-of-the-mill omnivore, but as a vegetarian there is a certain degree of seeking and discovering such sustenance that really enhances the experience. See it. Pick it. Eat it. For me, there is no better place to enjoy the bounty of the earth in blissful instant gratification than at the Leaning Shed Farm in Berrien Springs, MI. My wife and I spent Labor Day weekend with her parents, aunt and uncle at Leaning Shed, reveling in the honesty and integrity of a vocation that can simply be described as laborious. While factories, offices, schools and the like enjoyed a day off in observance of the national holiday, Dave and Denise Dyrek, the farm’s owners, continued to labor, picking sunflowers for the upcoming farmer’s markets and collard greens for a Chicago-area restaurant. Dragon's tongue is the green and purple speckled bean licking the sky. The Dyreks, who boast twenty-two kinds of tomatoes and heirloom tomatillos, bought their farm as lifestyle change—an escape from Chicago’s breakneck pace—and found that they loved to till their land. 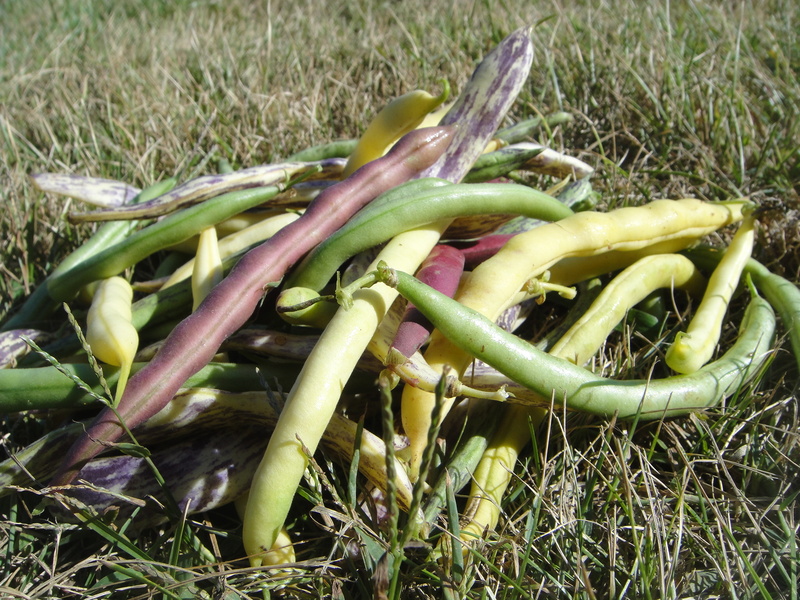 Despite the famousness of their tomatoes, Katelyn and I have an infatuation for their beans, especially for the strangely colored Dragon’s Tongue. I admit, the nerd in me is attracted to the name, but make no mistake, these beans are crisp, delicious and full of flavor directly from the soil. One of the highlights of weekend was joining in the harvest of their sunflowers—a truly heartwarming experience. Although the sunflower harvest wasn’t one as painstaking as tomato picking, for example, disappearing in that sea of gold had the power to transform the surrounding world into action and memory, all at once. For those who have not worked on a farm, or had a garden (or tended houseplants, for that matter), an unmistakable connection slowly reaches out of the soil into the tips of your fingers and warms the body whole like electric molasses. For the second straight year, we have enjoyed our Labor Day weekend on Leaning Shed Farm. Despite the sadness of the moment, the promise of a new spring will dawn and Dave and Denise will once again plan, fertilize, grow and harvest, and we shall all enjoy the spoils of their labor—vegetarian or not. For one weekend, at least, this vegetarian forgot all about being bitter.